In 2003, at the age of 76, Monsignor Alvin O’Reilly presented the New Orleans community with a priceless gift – the vibrant and fully restored St. Mary’s Church, a cornerstone of the Ursuline Convent that had been neglected for many years. As a result of Monsignor O’Reilly’s leadership and determination, St. Mary’s now welcomes thousands of visitors and locals through its doors – the culmination of a decade-long restoration project that he initiated and directed. His tireless effort to protect this piece of history had the additional benefit of uniting many of the residents in this French Quarter neighborhood, restoring not only a cherished, historical building but a renewed sense of community and neighborhood pride. Monsignor O’Reilly’s life experience has taught him that perseverance and determination can conquer seemingly insurmountable obstacles – if you believe in your goal, you will find a way to succeed. Through his experience he has also learned the value – and power – of people working together toward a common goal. While others might have considered the amount of funding needed to restore this historic landmark unattainable, Monsignor O’Reilly knew it would be possible through a shared vision with the community. His energy and commitment spurred countless people of many faiths to volunteer their time, their efforts and their contributions. People refer to Monsignor O’Reilly as a builder, not for the countless hours of labor restoring St. Mary’s Church but instead for the way he has changed the face of this community. He was the catalyst in building a cohesive group of neighbors and friends that now regularly dine and even travel together. Even today, Monsignor O’Reilly is the glue that unites a wonderfully diverse French Quarter community. 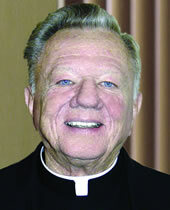 Monsignor Alvin O’Reilly… Tenet Choices Champion.